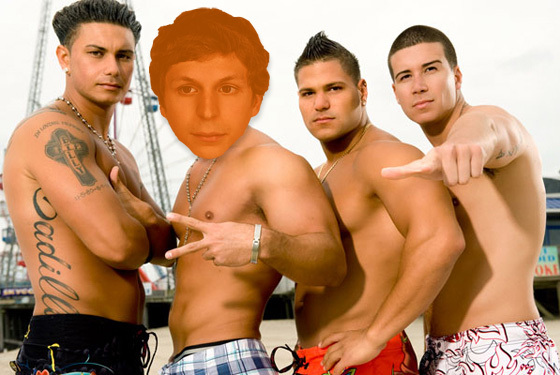 A helpful Weinstein Company publicist tells us that Michael Cera is hanging out with the cast of Jersey Shore on New York’s Lower East Side RIGHT NOW. They’re eating pizza at Rosario’s on Orchard Street and being filmed for an MTV special pegged to this Friday’s release of Youth in Revolt. Apparently MTV liked his movie so much that they told Cera he could do “anything he wanted” to promote it on their fine network. Naturally, then, he chose to spend an afternoon with the Situation. Videogum has an actual photo from the blessed meeting, which we only saw after we’d lovingly Photoshopped the one above. Michael Cera and Jersey Shore will air on MTV on Thursday, but if any Vulture readers on the Lower East Side happen to catch an early preview, let us know if anybody gets smacked or contracts pinkeye.